♦ When a young adventurer is snowed in, his predicament begins to parallel that of the icebound Antarctic explorer Ernest Shackleton. A young boy is all set for a school presentation about Ernest Shackleton's 1914-16 expedition to Antarctica when he gets unexpectedly snowed in by a storm. Taking charge of the ship (his house) and reassuring the crew (his family), the young captain records his adventures, which mirror significant details of Shackleton's infamous voyage, in his captain's log. Full of heart and imagination, the log transforms the family dog into his first mate, neighbors into penguins, and his little brother into a scallywag. The young captain does his best to perform his duties and care for his crew and ship just as Shackleton would have, but when the hardtack (cookie jar) disappears and mutiny threatens, the captain must resort to unorthodox methods to solve the mystery and get back on track. Dionne and Ebbeler have crafted a narrative full of spirit with small aesthetic choices that together capture the exhilaration of exploration and help connect the imaginary to the everyday. Historical details, including a glossary and brief account of Shackleton's treacherous voyage, enrich a story that takes its pretend play very seriously, and a multiracial family and an endearing protagonist of color are welcome inclusions in a predominantly white landscape of adventure tales. Entertaining, informative—utterly delightful. Just as he is putting the finishing touches on his school report about Ernest Shackleton's Endurance voyage, a young boy and his family become trapped at home during a blizzard. The boy chronicles his snowbound days as if he were Shackleton keeping his captain's log. He notes penguins (toddlers playing in the snow), fur seals (a snow-plowing neighbor), and a dwindling supply of hardtack (chocolate chip cookies). Adding to the difficulties is a scallywag (his younger brother) who climbs the mainmast (fireplace mantle) to sing a song and then absconds with the hardtack. Ebbeler's digitally enhanced mixedmedia illustrations successfully incorporate details about Shackleton's trip into the contemporary story. He uses paired cutaway views of the interiors of the ship and the house (which are similarly shaped), includes black line drawings depicting Shackleton's crew (next to their contemporary, full-color counterparts), and shows the young protagonist wearing nautical clothing. Appended with an author's note explaining the story's origin (Boston, the winter of 2015), this will please those in need of snow day humor. Scallywag! Conny onny! Mutiny! Deliciously nautical vocabulary peppers Dionne and Ebbeler’s delightful offering. An unnamed pint-size captain finds himself snowed-in on the day of his big report on Ernest Shackleton of Antarctic fame. Channeling Shackleton, the boy chronicles his marooned adventures via “captain’s log,” in which readers see the snowed-in family transition from happily snowbound to mutinous and back again with the thaw. In addition to the captain, there’s Dad (Ship’s Cook), mom (Photographer), the dog (First Mate), and the little brother (the hardtack-pilfering scallywag). Dionne strikes a good balance between narrative and informational text, lightly mirroring Shackleton’s adventures with our own captain’s, and provides an illuminating author’s note, glossary, and brief recount of Shackleton’s journey in the back matter, with two resource suggestions for independent exploration. Ebbeler’s illustrations shine here, providing emotion, movement, and detail with additional narrative and informational tidbits for observant readers. 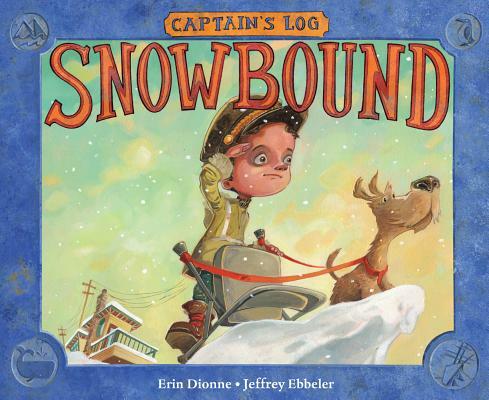 Educators will find this a fun title to use in conjunction with explorer or winter lessons, while families are bound to enjoy for the humor and dynamic illustrations. VERDICT Whether for fun or for curriculum support, Snowbound is a strong addition to library collections.